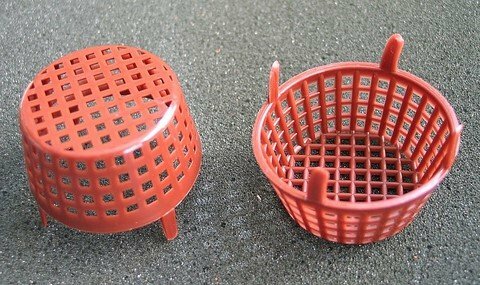 Kaneshin, Japanese maker of very high quality Bonsai tools, also make numerous other products including, 5 cm wide fertilizer cups for placement on soil surface to feed the tree gradually with each watering. Question: Quantity and type of fertilizer aside [assume appropriate for Bonsai and applied in recommended amount], what would be the optimal distribution on the surface of a 11" x15" container, for example, to deliver nutrients to all the roots? 4 total…1 on each side? Use these inexpensive brown plastic cups to keep birds away from fertilizer cakes that are exposed above the soil when the Bonsai is outside. Package of 10. How would you deliver nutrients to the roots by using a cup? When indoors put fertilizer near the trunk , when outside you use cups for birds and other animals. Kaneshin’s fertilizer cups are similar, though different, in that they have an operable cap and a central stem. What I am getting at is…as the slow release fertilizer is washed from the cup by watering it would seem that the flow of nutrients would be somewhat localized. Therefore, how many source locations are necessary to feed the roots in an 11" x 15" container? Interesting question, I hadn’t thought about it that way. I typically focus on how much fertilizer the tree is getting in total rather than how much is reaching which portion of the roots. I also use a combination of wet and dry fertilizer so all of the roots are getting at least some food on a regular basis. For deciduous trees in refinement, I’d use a small number of locations for the fertilizer, maybe 2-5 depending on the variety and the size and shape of the trunk. For black pines to be decandled, I might cover the entire surface of the soil with fertilizer in spring. I agree with everything Jonas said above. The how much question is a bit difficult to answer because there are variables-the strength and size of each cake, the type of tree and goal of the tree for that year. If your goal is to thicken branches or grow a trunk you will add way more than if your goal is to maintain refinement. At one point I switched from 100% organic cakes to mostly organic with lots of fish emulsion and some chemical fert. It seemed to me that I only had to use about 1/2 the amount I used in the past. If you don’t seem to be getting the growth you want, then add a bit more. If you are getting too much growth, then remove a few. Another thing is that sometime between 1-3 months, I’ll usually replace each cake as they are not affective after that time. Hope that might help. Thank you for your comments…I am piecing together a picture of a solution. As I am less concerned with the type, quantity, frequency etc. of fertilizing…my question is one of geometry. What soil areas are not receiving fertilizer, in a container of x,y and z dimensions, in a given layout of tea bags, cakes or cups? Jonas’s comment addresses, in part, deciduous trees, which if I understand it correctly, can nourish a tree with roots located on one side of a tree. However, with conifers, I have been instructed, roots located on a certain side nourish that side of the tree. This is what prompted my somewhat overly anxious question…the concern that certain roots, and therefore certain portions of the tree, would not be fed. Both you and Jonas are correct I am sure that augmenting with other fertilizers will make up the difference. dd1- on Jonas’s site Bonsaitonight.com type in Fertilizer in the search column and scroll through a few pages. You can see how people are spacing their cakes. I don’t think you need to be too concerned with certain areas not getting fertilizer. Just space them some what equal distances, some closer to the trunk, some further away. I believe the fertilizer from a cake is spread out to a larger area than the size of the cake when you water. If you were feeding say a Juniper and you wanted certain branches to receive more food, you would want to place more cakes over the roots which connect to the live vein which connects to that foliage. However you don’t have to be concerned that every square inch of the pot is covered by a cake. I hope that is pointing you in the right direction and makes sense:) Thanks.